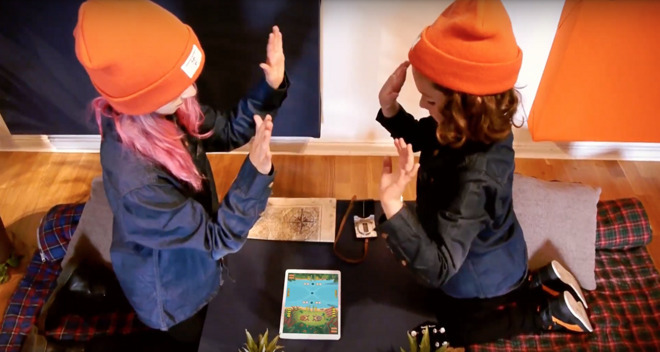 Like "Dance Dance Revolution," "Guitar Hero" and other music-based titles, "Clapper" relies on input timing for players to succeed. Onscreen cues tell the players where and when to clap their hands against one another, corresponding with notes played in the game's music. The iOS title is played with an iPad laying flat on a table, facing upward. Players look down to follow along with the gameplay, and the app uses the iPad's FaceTime camera to track how well the players are following along with the beat. "Clapper" can distinguish between five different types of claps, including straight, diagonal, and with multiple hands at the same time. Players clear songs to unlock new ones. Intended for children and adults alike, "Clapper" can be played in four different difficulty levels suited for both beginners and experienced players. The independent title, created by Bridgeside Interactive, was selected to be featured at the Indie Cade 2016 section of this year's Electronic Entertainment Expo. "Clapper" for iPad is currently available on the iOS App Store priced at $2.99. It requires iOS 8.0 or later.